Naramachi means the area centering the former premises of Gangoji Temple, a World Heritage Site. Back in 710, when the capital was relocated in ancient Nara called Heijokyo, Hokoji Temple (Asukaji Temple) in Asuka is said to have been moved to Heijokyo as Gangoji Temple. Naramachi, the “Outer Capital” of Heijokyo, is a town having a long history, which developed along the streets of the ancient capital. Since the relocation in Heijokyo, Naramachi has developed through its repeated ups and downs against a long historical backdrop. Originating in a town of shrines and temples called Nanto (South Capital), Naramachi developed as a town of commerce, and then as a town of tourism. Its townscape of old merchant houses called machiyabuilt from the late Edo period to the Meiji period offers visitors comfort and ease, sometimes making them feel some nostalgia for good old days. Naramachi has unique characters. Please walk slowly to find out all such features. 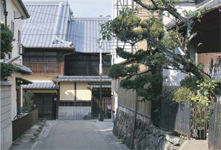 Merchant housing in Naramachi is characterized as its narrow width and long depth. It is said that this is because tax was imposed according to its width at that time, and merchants preferred to face main streets for their business. Lattice sliding doors are attached to the front of the machiyahousing so as to control the sunlight and airflow. The latticework also helps avoid eye gaze from the outside. Around Takabatake facing a road leading to “Takisaka no Michi(Road)” of the former Yagyu Highroad, you can see a sober townscape surrounded by stately earthen walls. Many of them are simple soil walls, not finished in white plaster. In the parlor, you can see stairs using a chest of drawers. Over a long period of history, people learned to make a full use of their limited land and space. 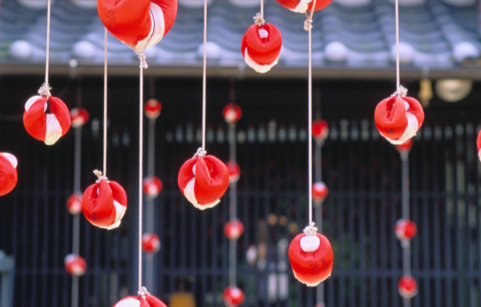 In Naramachi, you often see a red fabric ornament hanging from the eaves. This is a charm representing a monkey messenger of “Koshin-san.” The monkey suffers calamities in your place, so it is called a “Scapegoat Monkey.” Hanging such monkeys from the eaves of private and mercantile houses now becomes a tradition of Naramachi. 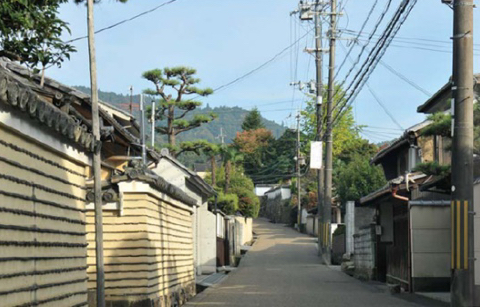 After prospering as a town of temples and shrines, Naramachi changed into a town of merchants. Even today, historic shrines and temples, as well as quaint long-established stores, still remain here. Traditional merchant housing renovated as new facilities are also high spots for visitors. Eight Best Views in Naramachi are selected for visitors, focusing on their uniqueness to Naramachi or historic value, not on their scenic beauty or name recognition. This area prospered as an entertainment quarter from the early Meiji period to the Taisho and the Showa periods. Even today, a small number of geisha houses for contemporary geisha girls remain here in a calm atmosphere. Standing in a place, where the residence of the head priest of Daijoin of Kohfukuji Temple was located, you can just overlook the five-storied pagoda of Kohfukuji Temple, feeling a 1,300-year history through the current townscape of Nara. This hall is roofed with round and plain tiles, of which style is called “Gyokibuki.” Even today, some of the tiles are original ones produced in the Asuka period. The hub shrine of “Koshin Belief,” which became popular among common people in Naramachi. “Scapegoat Monkeys” are hanging from the eaves of the local houses as charms to expel evil spirits. This highway leads to the Kamitsu-michiroad connecting Nara and Asuka in ancient times. The street, which allows you to imagine a bustling atmosphere created with many visitors coming to inns and stores at that time, still remains. A traditional merchant house in Naramachi is reproduced as a facility, which allows you to know the lifestyle in old times. You can easily imagine how people of that time lived. Daijo-in is a sub-temple of Kohfukuji Temple, which prospered as a temple of which head priest was a member of the five regent houses or the shogun families. Daijo-in was relocated here during the Kamakura period. Its garden was renovated into a circuit style one by Zenami, who designed the garden of Ginkakuji Temple. This has been a town of Kasugataisha Shrine priests since early times. A calm atmosphere of the town has attracted a lot of cultural celebrities, including Naoya Shiga, a famous writer. In Naramachi, there are a variety of tourist facilities, which tell you how people lived in the past. You can also enjoy seasonal changes here. Traditional merchant house in Naramachi is reproduced here. 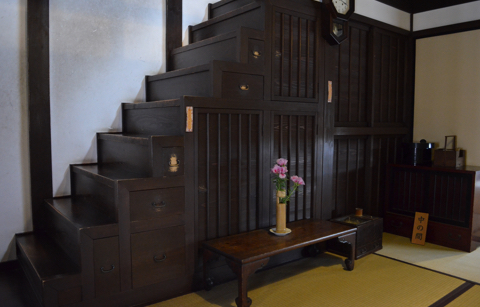 You can visit the house to directly learn the lifestyle of old merchants in Nara or how merchants lived at that time. You can also use the house as a place of relief. Traditional merchant house was renovated for this facility. In this house, people involved in town planning gather for interaction, transmitting a variety of information on town planning. Small shrine for Koshin belief in Naramachi. A charm of “Scapegoat Monkey” as a messenger of Blue-Faced Vajra is hanging from the eaves of the house to expel evil spirits. 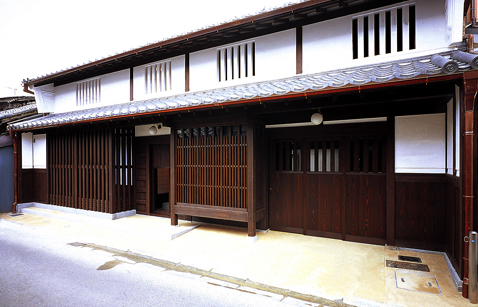 This is a shoin-style house, following the traditional form of the Muromachi period. This house is also a precious structure in the history of architecture in Japan. You can enjoy a bowl of powdered tea, looking at a well-maintained Japanese garden. Opening hours: 10:00 a.m. - 4:00 p.m.
A variety of old, nostalgic folkcraft articles, statues of Buddha, signboards, old coins, and other art works are exhibited. This artificial pond was made in 749 to release caught fish there as a religious ceremony called “Hojo-e” conducted by Kohfukuji Temple. The five-story pagoda surrounded by willows reflected on the surface of the pond is very beautiful, and that scenery is one of the representative views in Nara. The former residence of Naoya Shiga, a great writer of the Shirakaba school. Living for nine years from 1929, he completed his novel “Anya Koro (A Dark Night's Passing)” here. This house was also called the “Takabatake Salon,” where cultural celebrities and artists interacted with one another. An earthen tower like a seven-step pyramid 30 m in side and 10 m in height is said to have been built by Buddhist monk named Jicchu of Todaiji Temple in the Nara period. It is also said to be a burial mound for the head of a Buddhist monk named Gembo. This gazebo with cypress bark roof built in Hakkakudo-style (hexagonal shape) floats on Sagi Pond. It beautifully reflects on the surface of the pond. The gazebo is used as a place of relief by visitors, who can also enjoy cherry blossoms in spring and beautiful colored leaves in autumn. This is a long-established hotel founded in 1909 on the site of Daijoin. The building constructed all in Japanese cypress, top grade timber, was gorgeous. Its relaxing interior will also console the heart of a traveler. Naramachi, which has developed with a central focus on the former premises of Gangoji Temple, has lots of historical temples and shrines. Gango-ji Temple is one of the Seven Great Temples of Nara. It shares a foundation with Hoko-ji, the oldest Buddhist temple in Japan, which was built in Asuka, Nara by Soga no Umako, one of the major proponents of Buddhism in Japan in the 6th century. Gango-ji is also designated as a World Heritage Site "Historic Monuments of Ancient Nara." The principal image is Yakushi Nyorai (Bhaisajyaguru). This temple was built in 747 by Empress Komyo to pray for Emperor Shomu’s recovery from illness. There are lots of cultural properties here, including the main hall designated as a national treasure and the oldest statues of twelve divine generals in Japan. According to a legend of the temple, it is said this temple was built as a branch temple of Gangoji Temple, and was used as a place of prayer for Emperor Gensho. The main hall praised by a German architect, Bruno Taut, who loved Japan, is designated as a national treasure. It is said that its deity was moved from Ryoanji Temple in Gojo City, Nara Prefecture in 800 or the 19th year of Enreki under the reign of Emperor Kammu. Now, this is the shrine of the local Shinto deity covering more than 70 towns around Naramachi. This was a sacred place for a belief in Jizoin ancient Nara. The main hall constructed in the Kamaukura period and a seated statue ofJizo Bosatsu(Kshitigarbha) having a halo with thousand images of Buddha approx. 7 m in height are designated as national important cultural properties. This shrine was built to comfort the spirit of Uneme, who threw herself into Sarusawa Pond. Having been loved by the emperor, she grieved for his change of heart. However, there is a legend that her spirit turned the shrine backward in one night not to see the pond, into which she threw herself. *The photo shows the Uneme Festival. 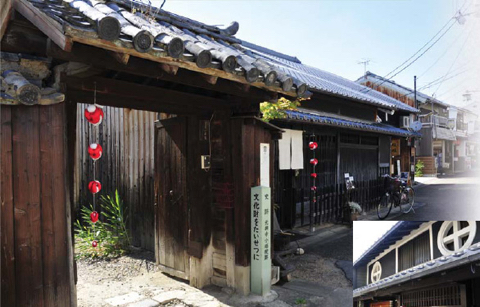 Ganriin-cho is an entertainment quarter having a history of almost 140 years. The area is said to have been named Ganriin since there was a branch temple of Gangoji Temple. 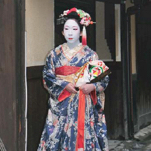 Having prospered as an entertainment quarter since the Meiji period, there were more than 200 geisha and maiko girls during the Taisho period. Even today, a number of geisha houses of that time still remain. 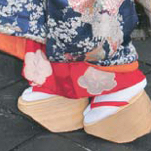 Walking in Ganriin-cho in the evening, you may encounter a maiko girl passing by you with her high belled wooden sandals called “Koppori” ringing like a slowly ticking second hand of the clock. Her figure accompanied by elegant gestures is so beautiful that you will feel as if you were watching a moving picture together with her background scenery. When you see a maiko girl in Ganriin-cho, please press the shutter button in your heart without taking out your camera. Her beauty from within will surely leave a wonderful picture in your heart by regarding her tinkling “Koppori” as shutter sound.